When trying to develop a recipe, there’s often some kind of inspiration behind it: A fresh ingredient, a creative restaurant dish, or maybe just an aroma that serves as a catalyst to inspire a new dish. With a mix of Chinese, Japanese, Thai, and Italian concepts and ingredients, it’s hard to say where the inspiration for this dish came from. In all honesty it may have been nothing more than a lone eggplant and expiring pork cheeks that set the wheels in motion. Whatever its genesis, it was good. So good, in fact, that I decided to develop it into a proper recipe and share it with all of you. The preparation is simple, and minimizes the amount of cooking time to avoid generating any additional heat. 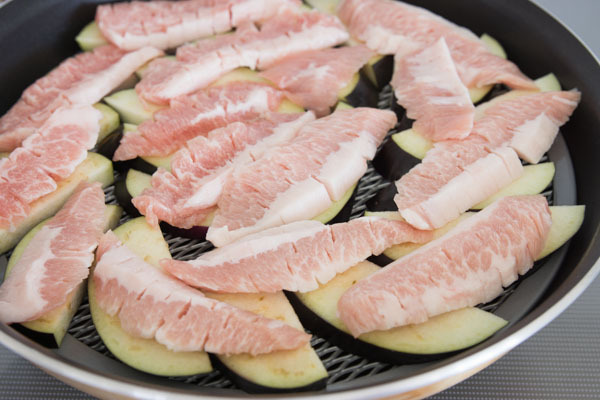 I steamed the pork and eggplant, which not only speeds up cooking, it also avoids the use of additional oil. The best part though is that by cooking them together, it allows the juices dripping down from the pork to infuse the eggplant with flavor. The cappellini takes about two minutes to boil and provides a wonderful al dente base when chilled. The sesame miso sauce is actually more of a broth thanks to a copious amount of dashi, which seasons the steamed pork and eggplant before trickling onto the bed of chilled noodles, coating each strand with an earthy umami rich sauce. While the idea of chilled noodles may seem odd to those accustomed to Italian pasta dishes, in Asia, where steamy summers tend to suppress appetites, cold noodle dishes are a summertime staple. In a way, I guess this is a spiritual cousin to a Japanese dish called somen. It’s made with the eponymous thin noodles, boiled and chilled in ice water. Served with a dashi based dipping sauce and condiments such as ginger and shiso it’s a hallmark of summer in the same way that fireworks and shaved-ice are. I used pork cheek for making this because of its fantastic marbling, but if you can’t find it, other marbled tender cuts such as pork shoulder will work just fine. For the dashi, making it from instant dashi granules will work, but if you can, it’s best to make the dashi from scratch. It doesn’t require a ton of time, and can be used in all kinds of dishes. 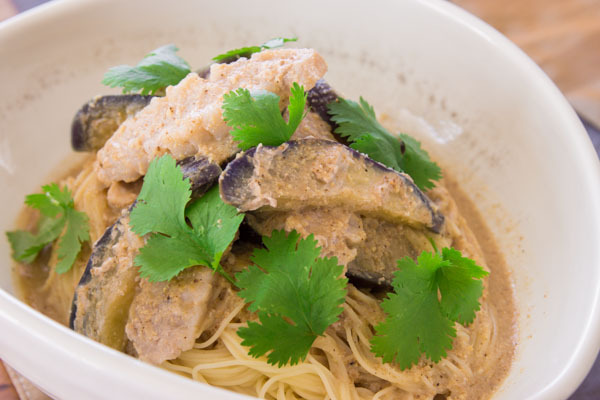 This creative pasta steams together pork and eggplant. 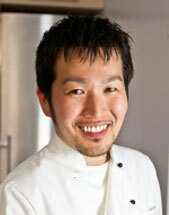 Marc Matsumoto explains the inspiration for this cappellini dish in a full post on the Fresh Tastes blog. Slice the eggplant in half lengthwise and cut into ¼-inch thick slices. Add water to a steamer and lay the eggplant in a single layer in the steamer basket. Top the eggplant with the pork and steam until the eggplant is tender and the pork is cooked (about 5 minutes). Meanwhile grind the sesame seeds with a mortar and pestle or in a spice grinder. Whisk the ground sesame seeds with the dashi, miso, sugar, ginger and season with salt to taste. 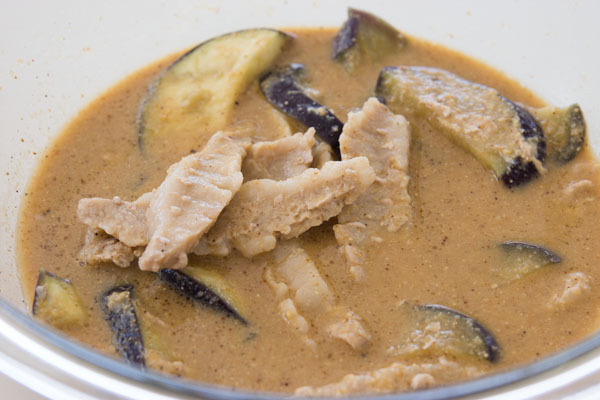 When the pork and eggplant are done, put them in a bowl and cover them with the sauce. Allow to cool to room temperature while soaking in the sauce. Bring a large pot of salted water to a boil and prepare a bowl of ice water. Boil the pasta according to the package directions and then drain the pasta. 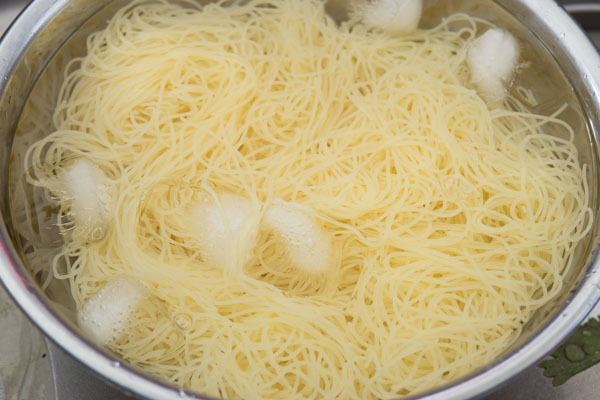 Rinse immediately with cold water and then plunge the pasta into the bowl of ice water to chill. To serve the salad, make a mound of pasta and spoon the pork and eggplant on top along with plenty of the sauce.